"A romantic suspense story set in beautiful Africa"
Set in the sizzling Serengeti, this romance puts the heroine THROUGH THE STORM of emotions and danger both. Tessa Henning, a fashion columnist, thought she married a decent man, but a discovery makes her fear her wealthy husband Brice. The evidence suggests he smuggles poached ivory. Since Tessa's sister died six months previously she has been caring for her young teen nephew and not paying attention to the world as much as usual. Now she has to flee with young Nick. Tessa's journey involves a light plane, and Mac Walker is the cranky bush pilot trying to keep Air Walker Safaris out of the red, ferrying excited tourists to photograph wildlife in Africa's spectacular landscape. He resents that the rich married woman expects him to be available to fly at short notice. But in reality he doesn't have anything much better to do. Tessa knows that Mac volunteers for wildlife studies - she knows which side he is on. But she doesn't want to tell him anything, just in case she's wrong. I really enjoyed the setting of course; we see a meal with a modern family in a Kenyan bush lodge, complete with solar panels. The landscape is finely drawn with acacia and fig trees, and dust in the shimmering view as elephants stroll and feed. Living here and ecotourism are compatible and bring in much needed income for the locals. Mind, Tessa nearly freaks when she is told there's no internet. There's enough excitement for anyone with a territorial male ostrich chasing the little group and a visit to a baby elephant rescue camp. And gradually as the tension rises, the emotional connection between Tessa and Mac deepens. She's still a married woman with no intention of playing around. She's in deep enough trouble. And if her husband does happen to be innocent - well, no sense making him jealous over Mac. The reader is fascinated to see just how the situation will work out between brave Tessa and the very genuine guy. I also think young Nick shapes up really well. Ireland is one of the countries which recently destroyed a stack of seized rhino horn and ivory. 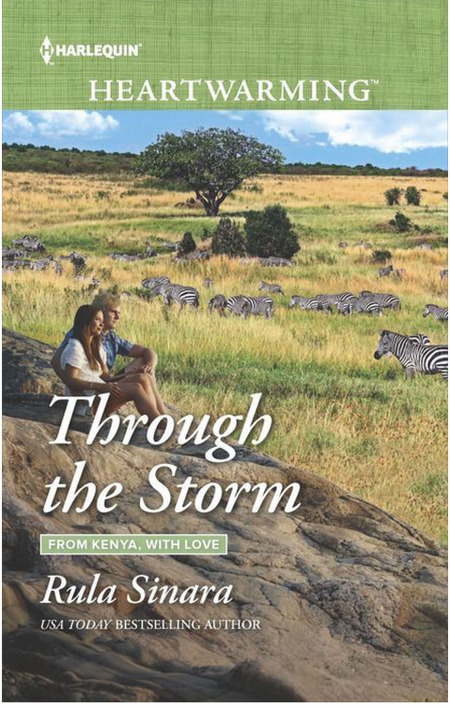 Rula Sinara is right on message with her riveting romance THROUGH THE STORM as wildlife is endangered to the point of extinction and the ivory mafia kill anyone who gets in their way. This tale is a great way to learn the truth about what is happening in Africa and around the world. Tessa Henning is no damsel. But she's definitely in distress. If her husband really is involved in the ivory trade, he'll come after her when he finds out what she's uncovered. Unfortunately, the only person who can help is Mac Walker. Stubborn, fiercely independent, danger-loving bush pilot Mac Walker�with whom she shares custody of their orphaned nephew. Though Mac's no knight in shining armor, he can keep her and their nephew safe in the Serengeti while they wait out this storm. But he can't protect Tessa from the strange weather brewing inside her, stirring up feelings for Mac she wishes she could ignore.